There are several options in metal fencing. The most popular option continues to be aluminum fence panels, a lightweight, rust free and low maintenance option which makes it a popular metal fencing option. Aluminum fence is perfect for enclosing your entire yard or a section of your yard such as an in ground pool. Whether you are looking for pool fencing or decorative fence aluminum is the perfect material for a variety of purposes. Homeowners choose to install fencing for a variety of reasons. The aluminum fence panel design that you choose will depend on the reason you are looking for fencing in the first place. For instance, if you are choosing to install a fence around your yard to contain pets you will want to choose a panel that offers puppy pickets or extreme spacing. Puppy pickets are an additional shorter picket to ensure that the animal is not able to squeeze through the fence. Extreme spacing in aluminum fencing is an extra picket between the normal pickets that extends all the way to the top. Aluminum fencing offers numerous benefits over competitive materials such as wood, vinyl, wrought iron or chain link. Aluminum fences are covered with a powder coating that provides a maintenance free, smooth finish with an attractive appearance. The powder coating also helps prevent corrosion and rust, making aluminum a maintenance free fencing option. This also helps make it affordable. The extra expense up front over other fence materials is easily recouped when you look at the money that is required to maintain them. When looking for a fence that is customizable aluminum is the most appropriate option. With aluminum you can choose from a number of styles of decorative and ornate aluminum fencing panels. On top of choosing a style that fits your homes décor you can customize it with butterfly scrolls, historical finals, finials that are pressed and even spacing between the pickets. You can customize aluminum fence panels to meet your need. In order to get the most out of your aluminum fence it is important to plan ahead. The winter season is the perfect time to start preparing for the installation of your aluminum fence in the spring. Take the measurements of the space you are looking to install the fence and contact a fencing expert. Consult with an aluminum fencing expert now to prepare your fence order. This will ensure that your fencing is all set to be processed, the necessary materials are in stock and that the order is ready to ship when you are ready to install it in the spring. iFence USA offers a variety of maintenance-free, no-rust aluminum fences and gates in the industry! Whether you are a pool contractor, a building contractor, an architect, a landscaping professional, or a “do-it-yourself” homeowner looking for value and installation advice, you’ll benefit by buying aluminum fences shipped factory-direct from http://www.iFenceUSA.com! This entry was posted in aluminum fencing, metal fences, pet containment and tagged aluminum driveway gate, aluminum driveway gates, aluminum fence, Aluminum fences, aluminum fencing, aluminum gates, aluminum pool fences, aluminum pool fencing, Metal Pool Fences on January 27, 2015 by admin. Winter is the perfect time of year to start planning for your aluminum fence. Taking time to plan for the purchase now will ensure that you are settled on the details and your order is complete to be shipped at a later time of your choosing. Working with an online aluminum fence supplier that offers full service throughout the planning, design, ordering and installation process; thus saving you time and money while ensuring a successful project. Don’t gamble with shopping carts when you can work with companies that provide expert customer service while still enabling you to order online. One of the most important things you can do is familiarize yourself with the variety of aluminum fence panels and options that are available. This will help to ensure that your expectations are obtainable. Aluminum fencing comes in a several different grades. You can choose from residential, pool, commercial and industrial grade fence panels. The styles of aluminum fence available also vary a great deal. It is nice to understand, before you are ready to order, the options available and what upgrades are available with each style. When you have come to a basic understanding of the style and grade of fencing you are looking for the next step is to begin laying out the area that is to be fenced in. 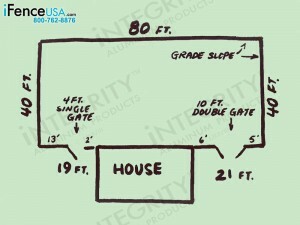 This requires taking time to measure the space and to plan for gate entrance and exits. You need to look at the existing landscape as well. It is crucial that you accommodate landscape features that are permanent. 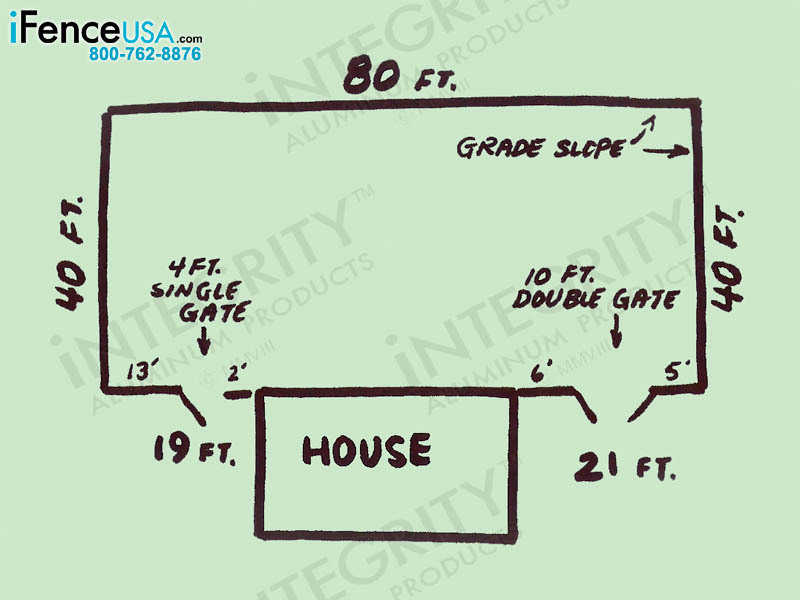 Make a simple drawing of the area; include measurements and details of the space. This will not only be useful for you but to the fence expert that will assist you. From your drawing the process of determining the needed fencing materials will be simplified. From your drawing and measurements you can determine how many fence panels, end posts, transition posts, line posts and corner posts you will need. You need to consider the width of the gates you want to install as well. This is where the project tends to become overwhelming for beginners. When you work with an online company that offers a full service approach you will be able to fax or email them your drawing. They will then be able to better assist you in preparing to order your new aluminum fence. Planning for your new fence is takes as much preparation, if not more, than the installation process. If you take the time now to thoroughly plan and order the correct aluminum fence panels, posts and hardware your installation project will be flawless. This entry was posted in aluminum fencing, Aluminum Gates, Driveway Gates and tagged aluminum driveway gate, aluminum driveway gates, aluminum fence, Aluminum fences, aluminum fencing, aluminum gates, aluminum pool fences, aluminum pool fencing, Metal Pool Fences on January 12, 2015 by admin. Why Choose iFenceUSA Over Other Online Fence Companies? Our mission in offering aluminum fencing is to empower our consumers with all the information they need to help them design, order and install their new aluminum fence panels! At iFenceUSA we offer a full service approach to aluminum fencing. Our fence experts are on call to assist you throughout the entire planning process. Let our knowledgeable team assist you in designing, ordering and installing your aluminum fence panels today! Don’t gamble with a shopping cart – talk to helpful experts instead! Call today – (800) 762-8876! This entry was posted in aluminum fencing and tagged aluminium fence, aluminium fences, aluminium fencing, aluminum driveway gate, aluminum driveway gates, aluminum fence, Aluminum fences, aluminum fencing, aluminum gates, aluminum pool fence, aluminum pool fences, aluminum pool fencing, Metal Pool Fences, pool fences, swimming pool fencing on January 6, 2015 by admin. When looking to install a fence at your home there are many option to choose from. Out of the options that area available, aluminum fencing continues to be one of the most popular. The benefits of aluminum fences are overwhelming when customers are looking at the advantages and disadvantages of different materials available in fencing. Below you will find a number of reasons on choosing aluminum fence over other types of fencing. Aluminum fencing gives owners the look of wrought iron but without the rust that is usually associated with it. If you are looking for a fencing material that does not require a ton of time or money to maintain than look no further than aluminum fence panels. Aluminum does not require a lot of time or money to maintain. The maintenance on an aluminum fence is as simple as a light washing every once in a while. There is no rust to scrape, no paint to touch up and never requires scrubbing to remove algae and mildew. When it comes to options in fencing aluminum offers many choices. You can find aluminum fencing in grades best for residential use, pool use, light commercial use and heavy industrial use. Not only can you choose what grade you would like the number of styles and option you can blend together leave endless options for your homes new aluminum fence. Aluminum is a corrosion-resistant material. Products made from aluminum do not corrode easily. When you install your new aluminum fence you will find that it is most likely offered with a powder-coat finish. This not only increases the beauty of the fence but also helps to protect the surface. Installing aluminum fencing is trouble-free in comparison to other types of fencing materials. If you are a traditional do it yourself homeowner, installing aluminum fencing is a snap. Save the money on installation and follow the step by step instructions offered when installing aluminum fencing on your own. If your aluminum fence happens to be damaged, which is unlikely given the durability of the materials used it is easy to repair. Repairs are easy on minor damage. If the damage to the fence is major, if a tree has fallen and demolished a section of fence an entire aluminum fence panel is easy to install without much disruption to the other parts of the fence. When it comes to the weight of fencing, aluminum is a light weight material that is widely used in residential, commercial and industrial use. It is not only light weight but incredibly durable as well. Aluminum fencing is affordable and most companies offer a lifetime warranty along with your purchase. What other materials in fencing offer a lifetime warranty? When it comes to options available in fencing there are a number of choices available. Aluminum is a material that is not only maintenance free but is available in several grades and color choices as well as being offered with a lifetime warranty. Not only is aluminum fencing easily installed it is also simple to design and install. Online you will find a number of companies that offer aluminum fence for sale; be sure to find a company that is full service and offers experts to speak with when designing, ordering and installing your homes new fence. This entry was posted in aluminum fencing on January 5, 2015 by admin.